Between work schedules, caring for loved ones, school activities, house work, community involvement, and other responsibilities, the day-to-day schedules of Americans are seemingly more packed than ever. In the midst of busyness, it is easy to cut out physical activity from your daily routine. Interestingly, according to the Center for Disease Control (CDC), “not having enough time to exercise” is one of the top ten reasons Americans do not engage in regular physical activity. National guidelines recommend at least 30 minutes three times a week as a good goal to shoot for, yet for many this is difficult to achieve. If you’re like many others, getting started can be challenging and even more so when you do not have a game plan in place. • Specifying what day, time, and location you will perform the exercise. If you have never tried planning your exercise or it’s been a while since you have, we encourage you to test it out for a couple weeks. 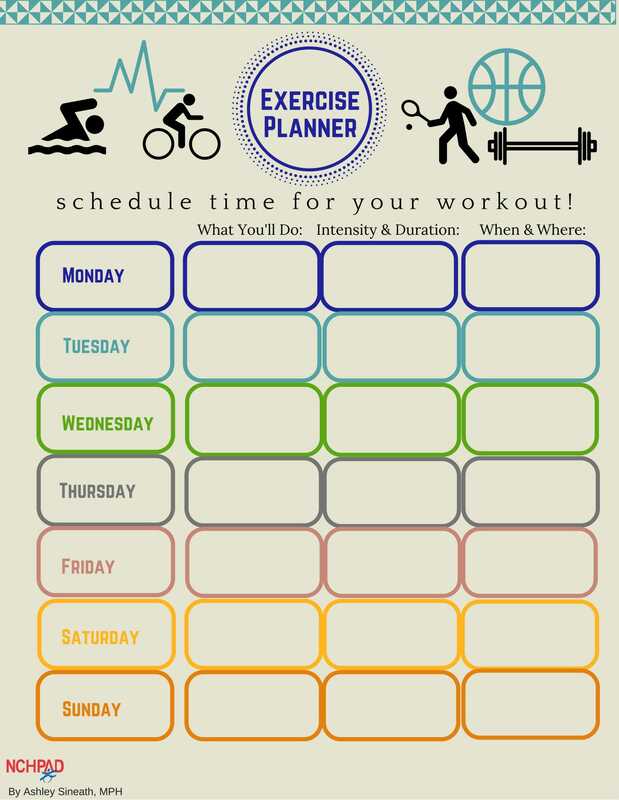 By taking 5-10 minutes to jot down your plan for the week including what you’ll do, how long, how challenging, the day, time, and place, you may give yourself a better shot of fitting exercise into your schedule. We also encourage you to invite a family member or friend to join you! • When & Where: Sunday afternoon, Wednesday before dinner, and Saturday morning at the neighborhood park. If you need more ideas for exercise, check out other NCHPAD exercise resources to get ideas on how to get moving.